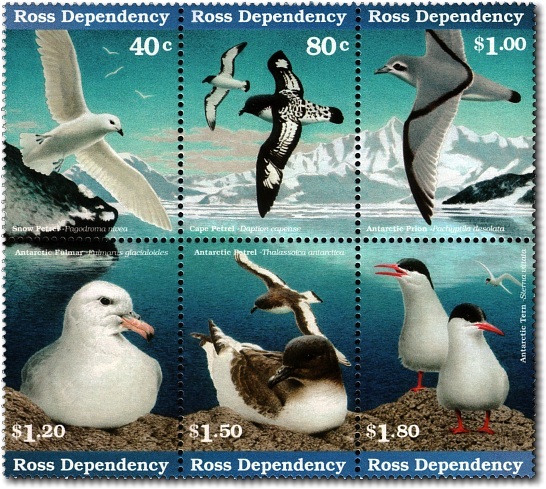 Six Antarctic sea birds are depicted on the 1997 Ross Dependency stamp issue. 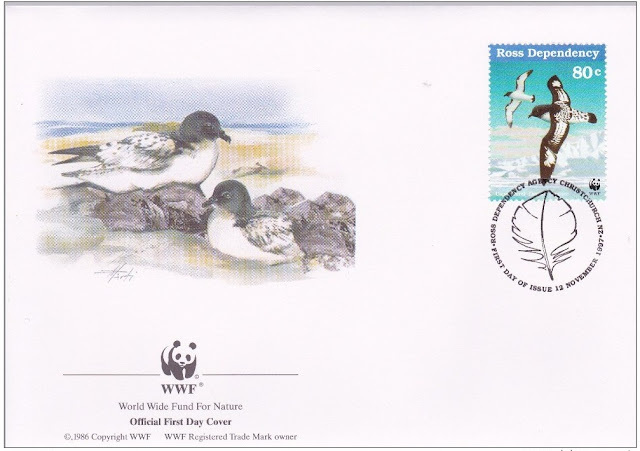 While the stamps were issued in sheets with the World Wildlife Fund logo printed on four of the six values, however all six stamps are available without the logo from the se-tenant block as can be seen above and on the First Day Cover below. 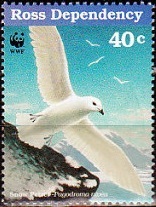 40c - Snow Petrel / Pagodroma Nivea with World Wildlife Fund Logo. The snow petrel as the name suggests is all white with contrasting dark eyes and small black bill, legs and feet. This bird is an erratic and swift flyer with a series of short rapid wing beats. They can be seen in groups hovering low over the open water searching for fish, which makes up most of their diet. 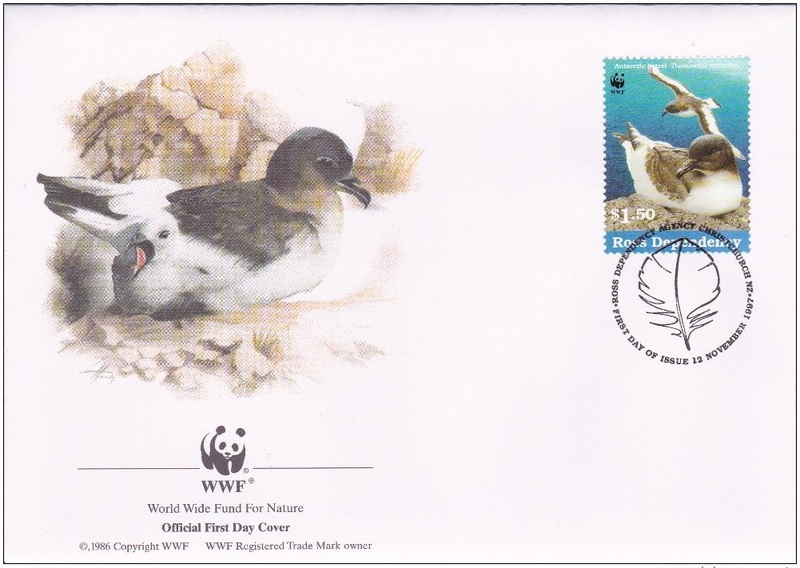 80c - Cape Petrel / Daption Capensis with World Wildlife Fund Logo. This is one of the larger species of sea birds that inhabit the open sub-antarctic and antarctic oceans. Opportunist feeders, they will gather in noisy large flocks to feed at sea on fish, krill and squid. They have also been known to feed on waste from fishing boats. $1.00 - Antarctic Prion / Pachyptila Desolata. A small sea bird, the Antarctic prion is a fast flyer which stays close to the surface of the ocean. They breed in vast flocks in both the sub-antarctic and antarctic islands between December and March and will migrate to warmer waters during winter. $1.20 - Antarctic Fulmar / Fulmarus Glacialoides with World Wildlife Fund Logo. 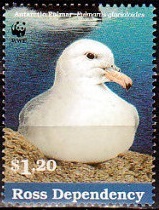 The Antarctic fulmar is an efficient flyer and will wander into the warmer waters during long antarctic winters. The birds are very territorial and defend their nests aggressively. $1.50 - Antactic Petrel (Thalassoica antarctica). 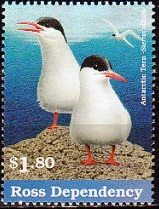 $1.80 - Antarctic Tern (Sterna vittata). $1.50 - Antactic Petrel / Thalassoica Antarctica with World Wildlife Fund Logo. 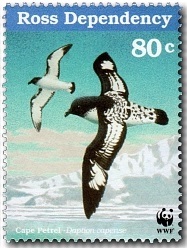 The Antarctic petrel gather in large numbers on pack ice or ice flows, where they tend to remain. They are one of the medium sized sea birds found in antarctic waters being about 45 cm in height. 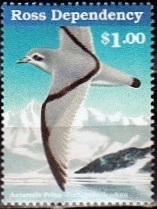 $1.80 - Antarctic Tern / Sterna Vittata. 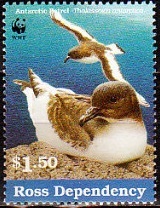 A small and delicate sea bird with narrow pointed wings and very short legs. They are a gregarious species and in winter flocks rest on icebergs and on the edges of pack ice. In summer months a colony will band together in the sub-antarctic islands and coastal areas of the Antarctic. 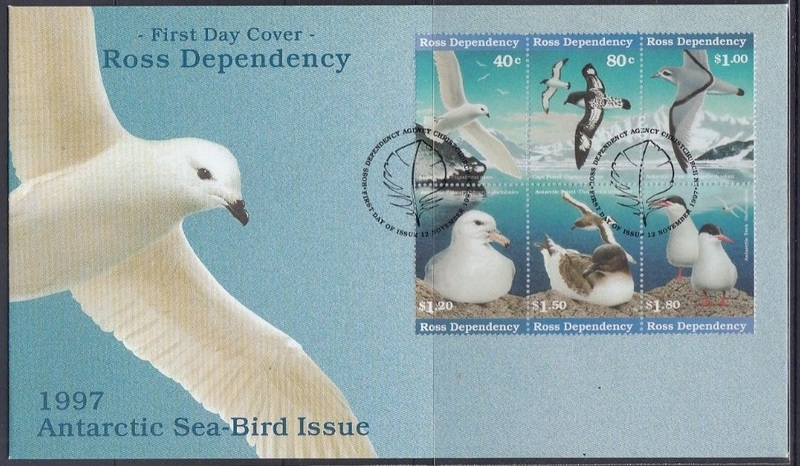 Ross Dependency First Day Cover (Without WWF Logo). Four of the stamps depicting the 40c Snow Petrel, 80c Cape Petrel, $1.20 Antarctic Fulmer and $1.50 Antarctic Petrel included the World Wide Fund For Nature logo. 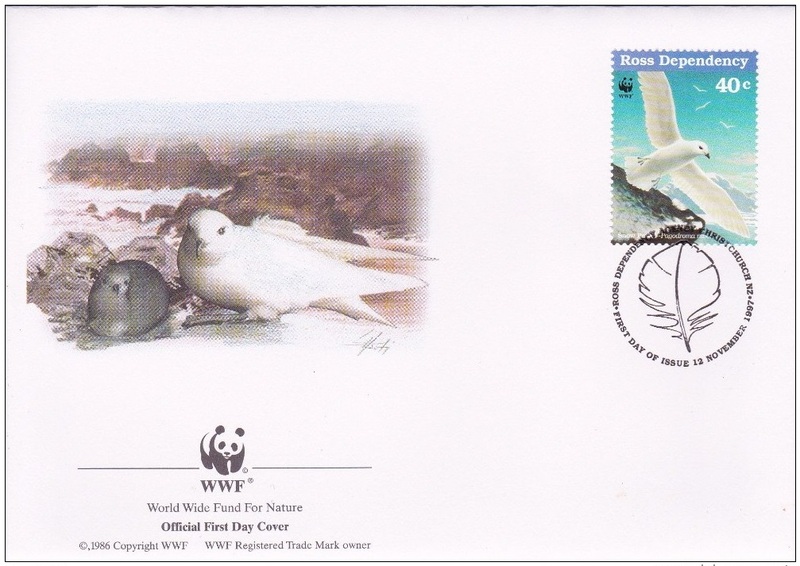 First Day Cover:- 40c - Snow Petrel / Pagodroma Nivea with World Wildlife Fund Logo. First Day Cover:- 80c - Cape Petrel / Daption Capensis with World Wildlife Fund Logo. First Day Cover:- $1.20 - Antarctic Fulmar / Fulmarus Glacialoides with World Wildlife Fund Logo. 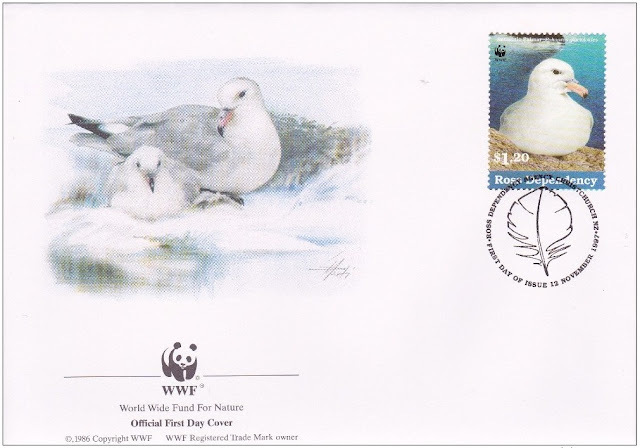 First Day Cover:- $1.50 - Antactic Petrel / Thalassoica Antarctica with World Wildlife Fund Logo.